Gone with the Wind meets wagon train Westerns…in South Africa in the mid-19th century. From there, we move into a series of stunning landscapes as a Boer wagon train treks across South Africa. Naturally, Katie and Paul will meet again. Katie will also meet Kurt (Richard Egan), one of Paul’s commandos, who takes an instant shine to Katie and pursues her regardless of husband, baby, and his own girlfriend/mistress. This is one of those melodramatic soap opera sagas that covers multiple years, long-running love quadrangles, and tempestuous weather events. It brings in a smattering of South African history and politics (the accuracy of which I can’t vouch for). 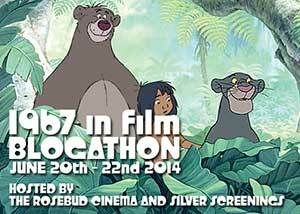 It’s also one of those movies where you want to shake the main characters into their senses. Why bother watching, if the plot is so hokey? Because it’s filmed well. Despite frustrating lulls in spots, there’s a sense of slow tension running throughout, and nothing is resolved until it really is resolved, at the very end – unlike lengthy plots which seem to resolve, and then continue on for reasons unknown to the viewer. Both Hayward and Power are strong, scene-commanding leads, with visible chemistry, and Richard Egan convincingly delivers a villain who oozes slime, yet isn’t without a few good points. But the No. 1 reason to watch: Seriously gorgeous cinematography. The lush African landscapes are stunning (“African sequences photographed at Zululand by courtesy of the Natal Parks Board”), and were probably even more breathtaking in their original CinemaScope. Director Henry King films a Zulu attack on the wagon train that must rank among the Top 10 Western “attack on the settlers” scenes, if you stretch the definition of Westerns to include other countries. There are Westerns in which the settlers are supposedly outnumbered 10:1, but the viewer remains unruffled. This isn’t one of them. The Zulu attackers look like they actually know what they’re doing, and the settlers are both seriously outarmed and outnumbered, and faced with unfamiliar enemy tactics. Susan Hayward’s character might be selfish and scheming at times, but she’s got the guts that Scarlett O’Hara lacked. At any rate, she doesn’t whine. Solid performances from Rita Moreno as Egan’s longsuffering love interest, and Agnes Moorehead as Aggie O’Toole, Hayward’s maid/housekeeper/fellow pioneer (a sort of Irish variant on the Hattie McDaniel role in Gone with the Wind). Significant lack of screen time for Tyrone Power, combined with too much for Richard Egan. Not that Egan is bad; he’s very, very good at being a louse. But Power flat-out disappears for a stretch that’s just a little too long for a movie like this. Random commentary that didn’t fit anywhere else: A moment of silence is in order for John Justin’s character. Justin plays the man Hayward marries after Power leaves Ireland, who goes with her and their child to South Africa. I felt sorry for him. He seems like a decent guy, but he marries Hayward in the first fifteen minutes, and Tyrone Power is still out there. You’re left making bets with yourself as to whether he’ll die right off the bat, or stick around to provide drama for a tragic love triangle. Poor guy didn’t deserve his fate. At 111 minutes, Untamed is half the running time of Gone with the Wind, just long enough to wrap things up before they threaten to overwhelm the viewer. This movie had me fooled. Up to a certain point, it looked like a comedy starring Dean Martin and Diana Lynn, and Raymond Burr and Veda Ann Borg as jewel thieves. And then it devolved into a showpiece for Jerry Lewis acting like an overgrown 12-year-old on helium with a sugar rush, shoehorned between musical numbers and nearly word-for-word scene repeats from The Major and the Minor. Jerry Lewis, it must be said, is no Ginger Rogers. The genders are swapped: Diana Lynn, who played the precocious teenager in The Major and the Minor, plays half of the Milland role, and the love interest, in this allegedly comedic revamp. Dean Martin also has part of the Milland role, and as a bonus, Martin has a fiancée (Nina Foch), aka the Rita Johnson role in TMATM, who shows up for a few scenes because the plot demands it. The school is a girls’ school, Jerry Lewis is an incompetent barber turned fake teenager because he’s escaping a jewel thief (Burr), who he (Lewis) thinks is a jealous husband (don’t even ask). (Short version: Burr drops a stolen diamond into Lewis’ pocket, and has to get it back, involving a series of misadventures as he follows him via plane, train, and around the school.) The jewelry thief subplot is a welcome distraction, and it’s probably the only reason anyone who watched The Major and the Minor kept watching ’til the bitter end. Watch if you’re a fan of Dean Martin and Jerry Lewis, or stick to the musical numbers, or utilize the fast-forward button. Or watch Untamed. You’re Never Too Young clocks in at 102 minutes, and Untamed has better scenery. 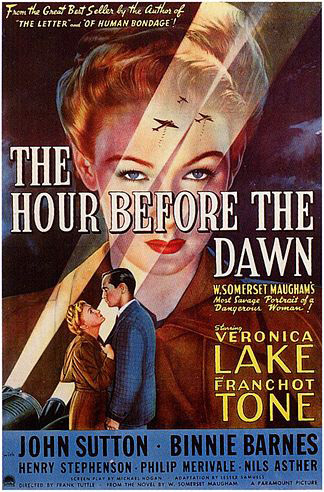 I don’t usually go into old movies blind, but I was excited to finally watch The Hour Before the Dawn (1944), one of Paramount’s elusive archive that has never been released on DVD. All I knew was that Veronica Lake was in it, that she played a German spy or sympathizer, and that the title sounded appropriately dramatic. Full of eager anticipation at watching one of Lake’s more obscure movies, and one with WWII espionage elements at that, I settled in for a good watch. The first thing that strikes the unsuspecting viewer, as the titles roll, is this. 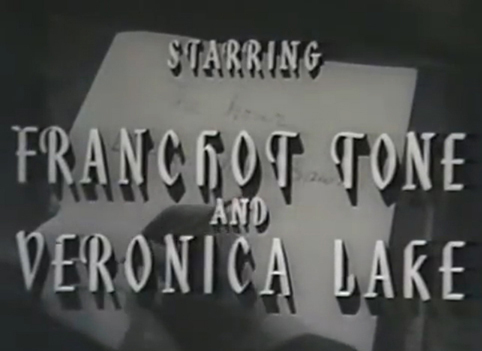 The second thing that strikes the viewer (after the Miklos Rozsa credit), is the director: Frank Tuttle. Three years earlier, Tuttle had directed Lake in This Gun For Hire, a tersely plotted, bona fide noir classic, and incredibly stylish to boot. We also note, in passing, that the movie is based on a story by W. Somerset Maugham. Well, not exactly “in passing.” We pan in on a giant leather-bound book, with “W. Somerset Maugham” in gilt letters. 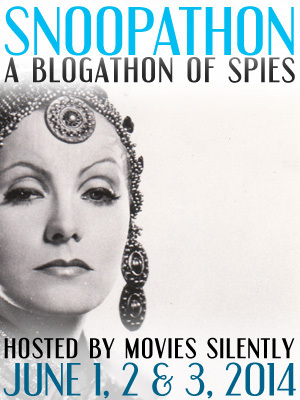 This is your tip-off that the action-packed, thrilling spy story promised by the poster is going to have a distinctly literary flair. Because it’s Maugham, however, it’s not a tip-off that the film is going to plod along at the pace of a cracked quill pen on vellum – to wildly mix a metaphor. But mixing metaphors is okay, because The Hour Before the Dawn isn’t sure what it’s supposed to be, either. Hello world, and welcome to my blog! I’m Ruth Sherwood (after the fabulous Betty Garrett’s character in My Sister Eileen), AKA The Counterfeit Writer. 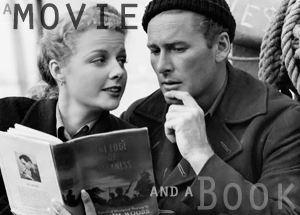 I’ve been a long-time classic film fan and avid blog-reader, and finally decided that I needed to launch a blog of my own, both to share my opinions on all the movies I’ve been watching, and to practice my rusty writing skills. I love all things classic film, mostly from the Golden Era, although I make forays into silents and modern movies at intervals. My perennial favorites are Technicolor musicals, film noir, screwball comedy, and anything with amazing costumes, but I’m discovering new aspects about classic movies to appreciate all the time. Much as I love classic movies, I also love vintage art and graphic design. In keeping with The Counterfeit Writer’s theme of “blogging the vintage visual arts,” in addition to my thoughts on old movies, you can expect to see posts on things like fashion in film, vintage art, illustrations, decorative book covers, set design, possibly the odd book review, and anything else that I happen to find interesting. Hello, and welcome! 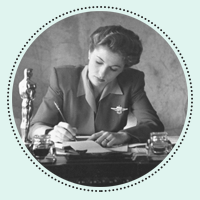 I'm Ruth, and I blog about classic movies, fashion in film, and vintage art & design of all kinds, from old book covers to Art Deco architecture - and anything else that catches my fancy. Among other things, I love film noir, Technicolor musicals, and Buster Keaton silents. Thanks for dropping by! Contact me at cft-writer [at] gmx.com. All content copyright Ruth Sherwood unless otherwise noted.